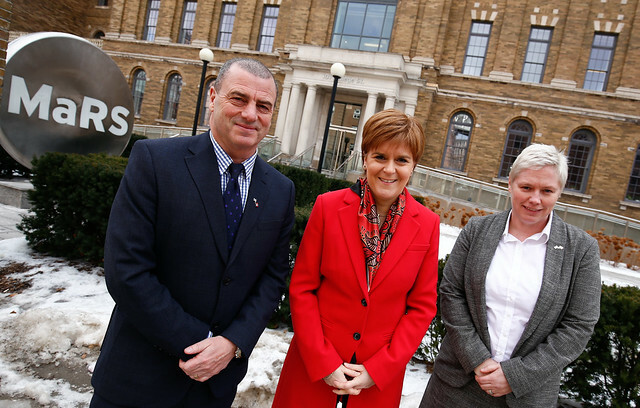 First Minister Nicola Sturgeon was in Toronto for the final day of her visit to North America. She started the day meeting the CEO and senior management team of the Toronto Region Board of Trade and World Trade Center, Toronto to discuss and promote trade opportunities, particularly in the digital, data and fintech sectors. Toronto Region Board of Trade is one of the most influential chambers of commerce in North America, with over 13,500 members. She then opened the Toronto Stock Exchange with Steve Dunlop, Chief Executive of Scottish Enterprise and Gillian Docherty, CEO of The Data Lab. The First Minister visited the MaRS Center and the Vector Institute in Toronto’s Discovery District, where she met MaRS CEO and senior team to discuss opportunities in data science and artificial intelligence. MaRS is the world’s largest urban innovation hub, and a world leader in providing innovation support for tech companies. She finihsed the day at a community organisation in downtown Toronto where she announced an international agreement to grow and sustain social enterprises in Scotland and Canada. The Social Enterprise Academy, the body providing learning and development for the sector in Scotland, has launched a new partnership with the Canadian Community Economic Development Network supported by Toronto’s Learning Enrichment Foundation and the Scottish Government.